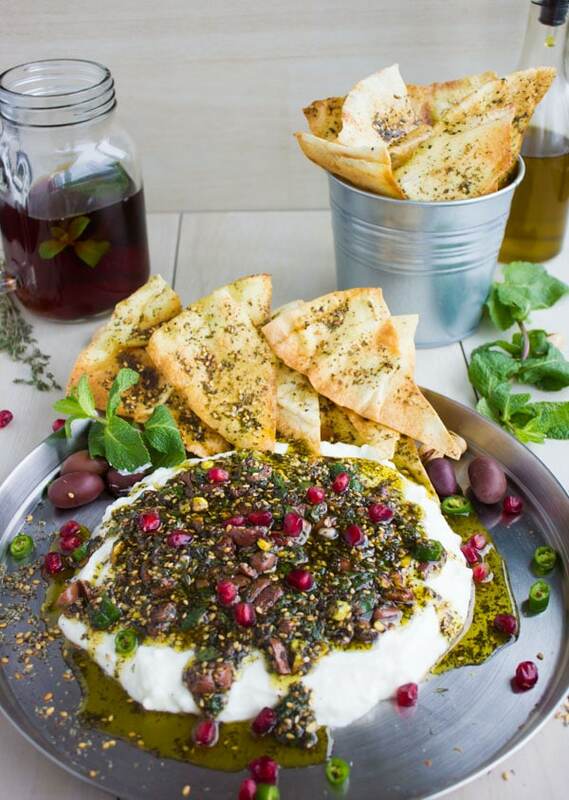 You simply cannot miss out on this Mediterranean Labneh Dip with Zaatar Pistachio Mint Olive Topping! 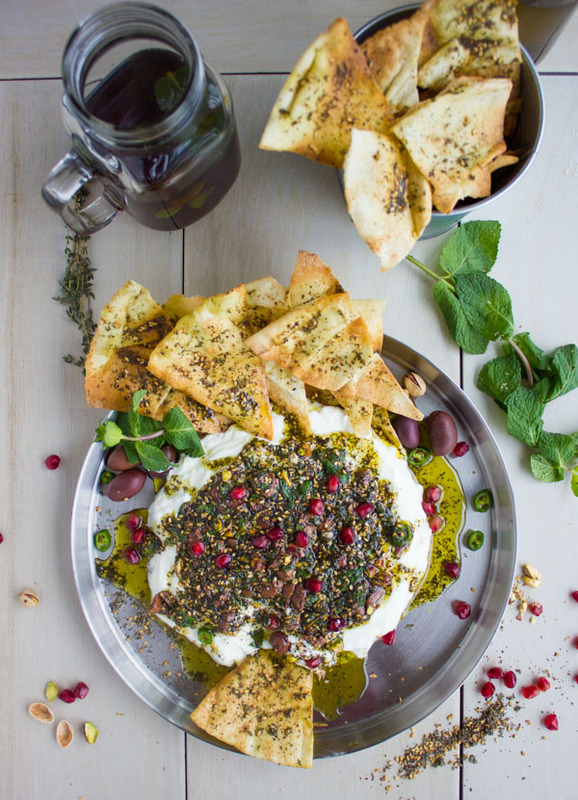 Sprinkled with fresh pomegranate seeds and served with zaatar pita chips – this easy labneh dip is the perfect appetizer or can be served as part of a mezze platter! 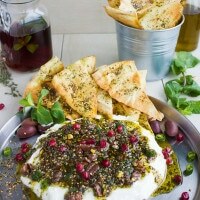 This Labneh Dip with Zaatar Pistachio Olive Mint Topping recipe is the best, most flavorful and lightest way to make a dip! Picture creamy smooth low-fat labneh or Greek yogurt. Top that with a mixture of zaatar spice, chopped olives, fresh mint and pistachios in olive oil! You simply cannot miss out on this Mediterranean Labneh dip! Sprinkled with fresh pomegranate seeds and served with zaatar pita chips, this dip is the perfect appetizer. It can also be served as part of a mezze platter! 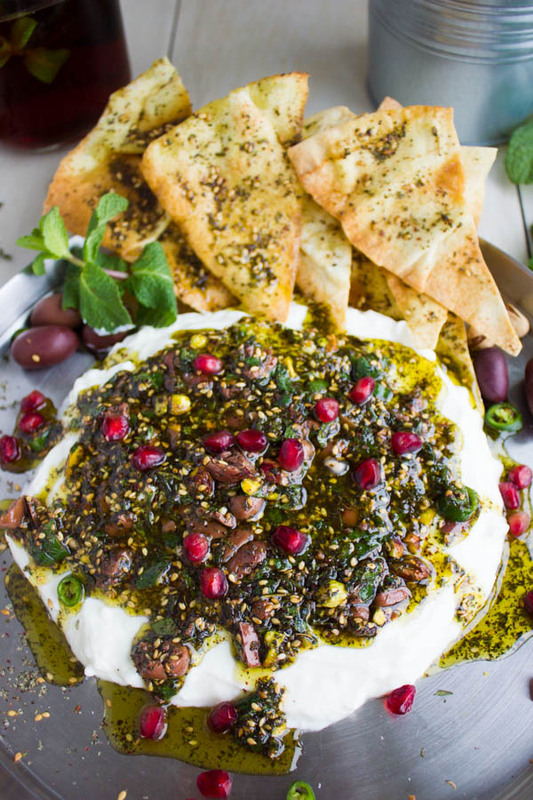 This easy refreshing Labneh Dip with Zaatar Pistachio Olive Mint topping is my way of twisting and adding a TON of flavor, freshness and punch to a classic Middle Eastern appetizer. 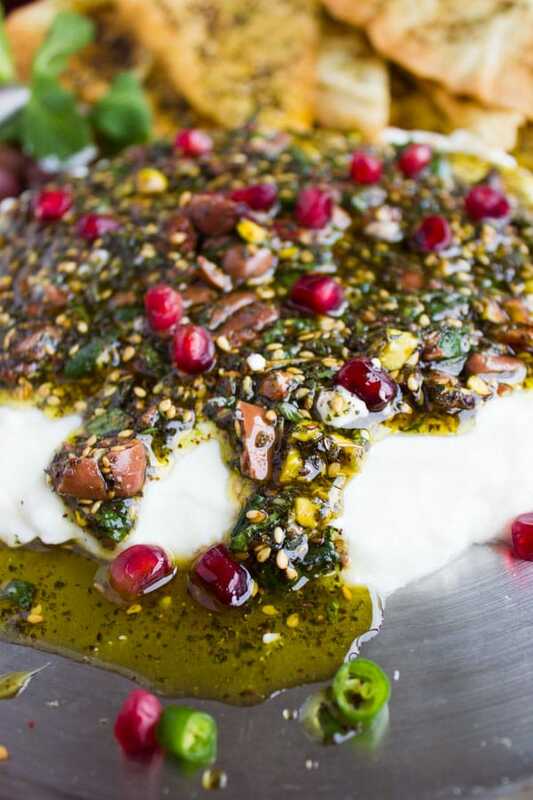 There’s something special about cool and tangy labneh that’s simply wonderfully contrasted with fresh mint, salty olives, crunchy pistachios, sweet pomegranate and rounded up in plenty of zaatar and olive oil! OMG, seriously you can not miss this labneh dip recipe! So have you ever tried labneh or at least heard of it??!! Well, I had it for the first time when we went to Jordan about 18 years ago and I found out it’s been around for centuries in many neighboring food cultures! Nowadays, I don’t think you need a trip all the way to Jordan to get your labneh fix. All you need is a close-by spot that sells it. Labneh is basically strained tangy yogurt with a bit of salt. It can be full-fat or low-fat. It has the texture of sour cream or Greek yogurt, but it has a more tangy and saltier taste. And hey, you can absolutely make it from scratch. If you’re in the mood for making labneh from scratch, simply strain a nice tub of tangy yogurt (Indian or Middle Eastern yogurts work best if you can find them) with a 1/4 teaspoon of salt, until the yogurt is thick and creamy. So how about the Zaatar spice? This spice blend is one of my favorites! These days, you should be able to find it in pretty much every grocery store and definitely in all specialty stores, spice stores and Middle Eastern stores. Zaatar tastes of thyme, lemon and sesame! It’s mostly used as a condiment, sprinkled over cheese, pizzas, salads, breads, dips and more. Toast these spices for about 1.5 mins until fragrant and toasty. To make life easier, you can absolutely combine the topping ingredients in a food processor. I like to chop them because I love a chunky texture and feel to them. And it really just takes a minute—because you’re not chopping large batches of anything, just a couple of tablespoons of each and they all get chopped up together. Spoon the topping ingredients over the top of the labneh and allow it to drip from the sides. Sprinkle the pomegranate seeds on top. Serve with pita bread (see “how to serve tips” below) and some minty red tea. 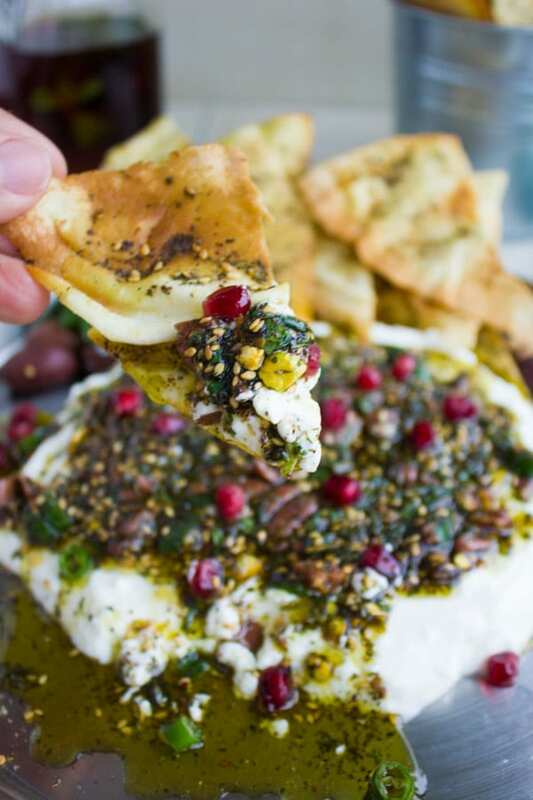 This gorgeously delicious labneh dip with zaatar pistachio olive mint topping can be served with any type of cracker or veggie you have on hand. I paired it here with my favorite zaatar pita chips. Just take thin type pita bread (not Greek style) and cut each into 8 wedges, then separate the upper and lower part of the bread so you’ll end up with 16 wedges from each pita. In a bowl, I mix some zaatar and olive oil and brush the tops of each pita wedge with this fragrant mixture, then bake the bread for 6 mins till crispy. Make a labneh dip with zaatar pistachio olives mint topping this SuperBowl for a different vibrant take on your classic game day flavors. And if you’re having a potluck, this labneh dip makes a perfect choice—assemble it last min and watch everyone go in for seconds and thirds! If you cannot find labneh and don’t want to make it yourself, use your favorite brand of Greek yogurt and mix it with an extra 1/4 teaspoon of salt! Pair it with this fabulous Turkish pizza Lahmacun and Turkish style chicken skewers for a flavorful out of the box menu! 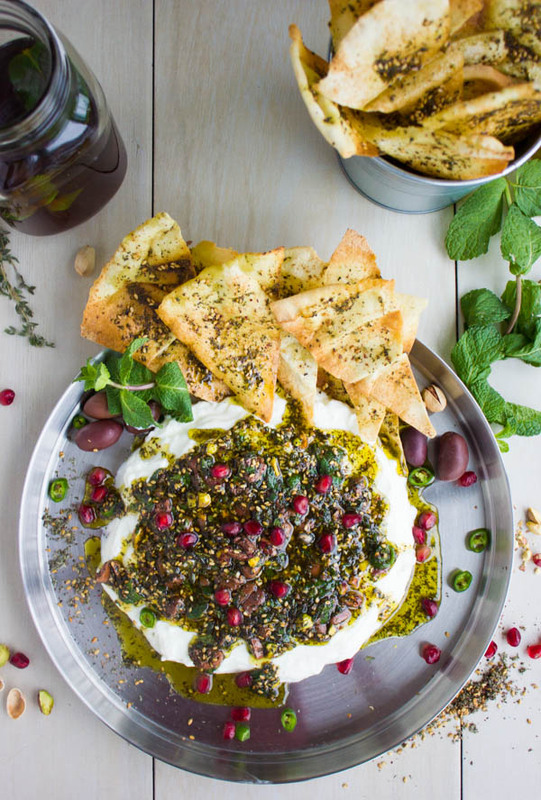 You simply cannot miss out on this Mediterranean Labneh Dip with Zaatar Pistachio Mint Olive Topping! 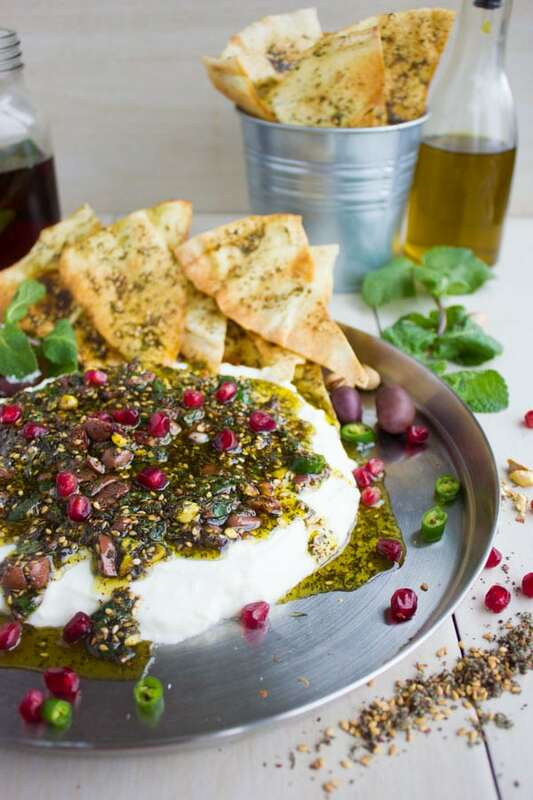 Sprinkled with fresh pomegranate seeds and served with zaatar pita chips - this easy labneh dip is the perfect appetizer or can be served as part of a mezze platter! If you cannot find labneh and don't want to make it yourself, use your favorite brand of Greek yogurt and mix it with an extra 1/4 teaspoon of salt! I’m always looking for new and easy dips to share with my friends and family when they are over. Thanks for sharing this recipe – it is absolutely gorgeous and sounds so tasty! Thanks Sarah–You will love this dip, it’s a new twist and really worth it! Thanks Holly–you will really love this one! Thanks Kit 🙂 Hope you try it! We went to Turkey this time last year and there was labneh everywhere. We loved it. They do love their cultures there as do many of the adjoining countries. Your dip looks fantatsic. 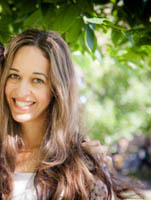 Enjoy Jen! I would have Zaatar everyday ! Moses, Thanks so much for your comment! I would love you to try this recipe and let me know and I can’t wait to check your website and your Zaatar plant too! Hello! This looks delicious! There are m sliced green chili peppers in the phots that aren’t mentioned in the ingredient list. What did you use? Thanks! Please share any substitutions you make so I can try that too!! What a delicious savory appetizer! This is perfect for spring and summer gatherings. I can hardly wait to make this for an upcoming party. It’ll be a real hit! OMG this looks incredible Mahy! I must admit I’ve never cooked with zaatar spice before, but def need to try it. your photos are gorgeous too, it has me drooling! You really are missing out Danielle!! THIS RIGHT HERE!! I love verything about this dish! Labneh is just so yummy (I make an “instant” version by just adding loads of salt to turkish yogurt) and zaatar is one of my new favorite spices. Have to go grab some and make this right this weekend! We are HUGE entertainers so this would be a perfect appy for us to always have out for our guests to enjoy. I especially love the flavor combo of the pistachio and pomegranate, how delicious! I can’t and I won’t miss this recipe! 🙂 It is amazing how beautiful it is and I can imagine that it tastes like it is nobody’s business! Yummy! That is delicious dip, I love Zaatar that is my favorite spice blend. I need to try it. Great with bowl of pita chips.